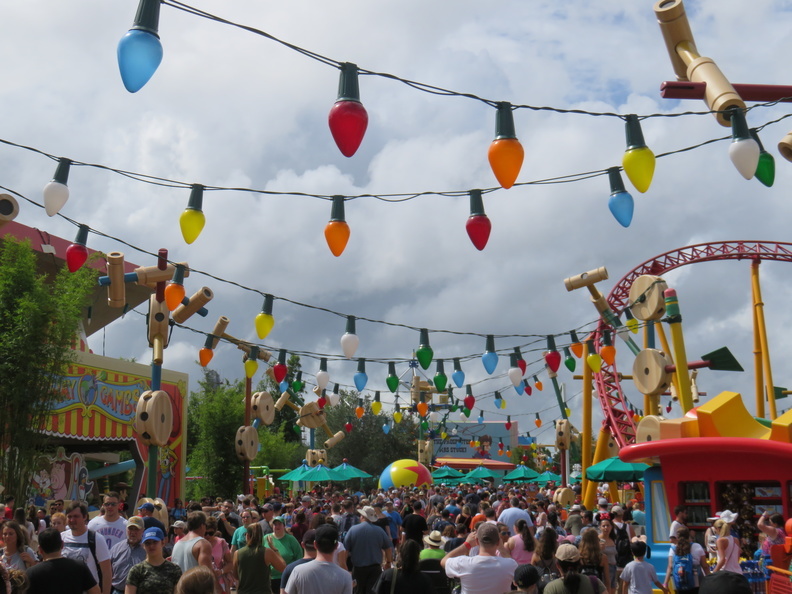 Then we walked over to the new Toy Story Land expansion to check out the new area. The entrance to Toy Story Mania has been moved into this new area (which makes sense) so you now enter from the back of the building (which I guess is now the front). 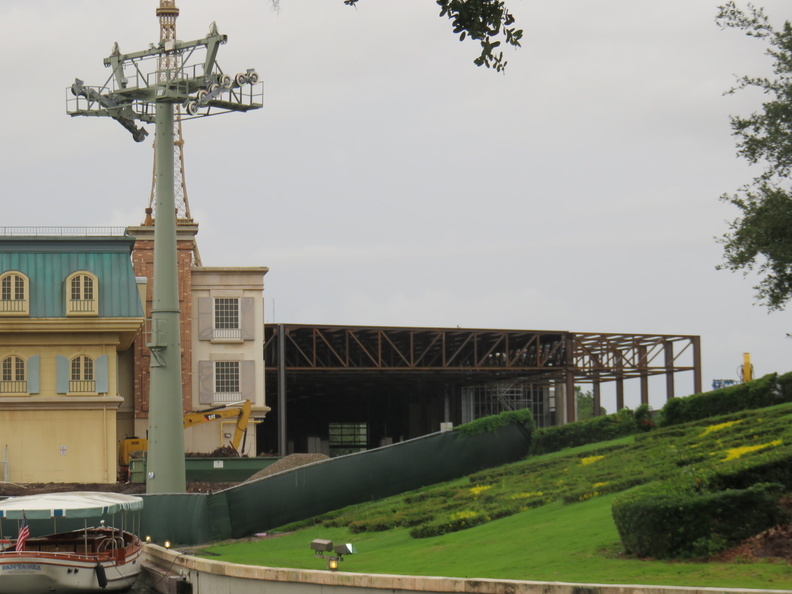 The old entrance is now blocked off for the Star Wars Land construction. The area is, of course, toy themed, with large board games, Cooties, wooden blocks, Tinker Toys, green army men, Christmas light strings, even giant footprints in the concrete to make you feel like you’re a toy in Andy’s backyard. The standby line for the Alien Swirling Saucers (ooOOoohhh, the Claw!) was only 50 minutes so we decided to wait. It’s a spinning (duh!) 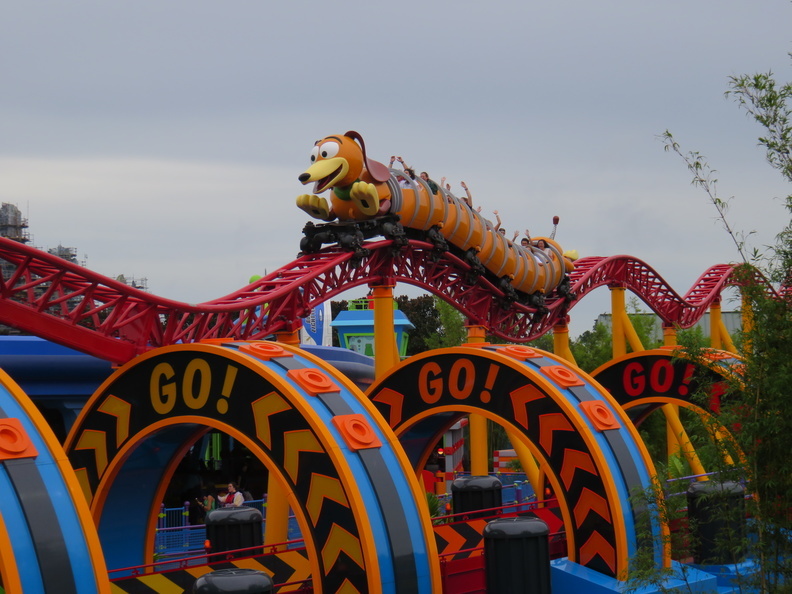 ride similar to the teapots except you don’t control the spinning and there’s a neat twist in how the saucers circle around the three different circular tracks. All of the blurbs about the ride mention “if you’re lucky you might be chosen by the Claw!” but I couldn’t see what that was referring to. 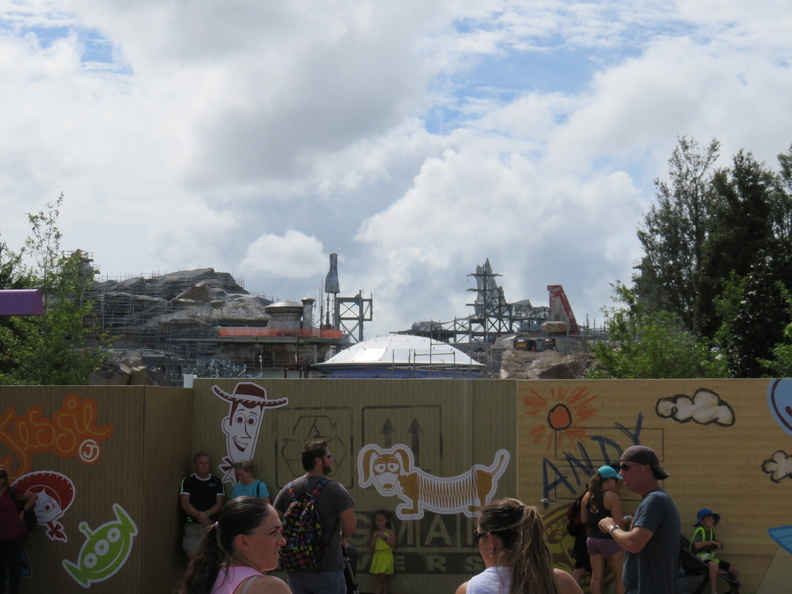 It was now time for our Star Tours FastPasses so we walked back around to that ride (with the Star Wars Land construction, Toy Story Land is currently a dead-end). Unfortunately, we still didn’t see any new sequences (I was hoping for something from “Solo“). Afterwards, while we were doing a little shopping back on Hollywood Boulevard it started raining. Since we still had a few hours before our Slinky Dog Dash FastPasses, we decided to take the Friendship boat over to Epcot for (what else?) lunch at the Food & Wine Festival. 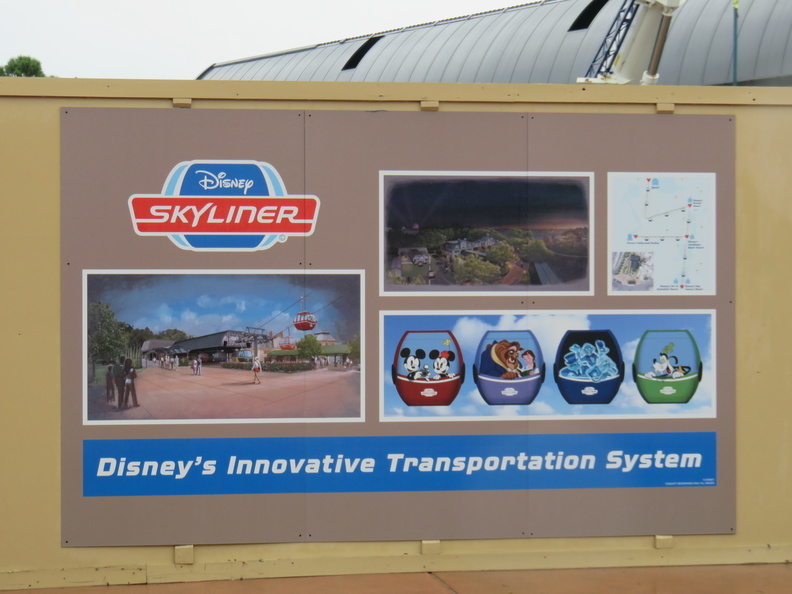 We disembarked at the Swan & Dolphin (which is the first stop) thinking we could walk to Epcot from there faster than the boat since it would also make stops at the Boardwalk and Yacht and Beach Club resorts first before going on to the International Gateway dock at the back of Epcot. As we were walking, however, the rain really started. It was too much for our umbrellas so we had to duck into one of the shops on the boardwalk and switch to ponchos. By the time we got through the gate around 2:00pm, we were pretty wet from the knees down. We spent about 90 minutes walking around the World Showcase getting food, but the lines were long and slow because most of the booths had just a single cashier since they had moved inside due to the rain. Some of the booths were having issues with the payment systems as well, which contributed to the backup. 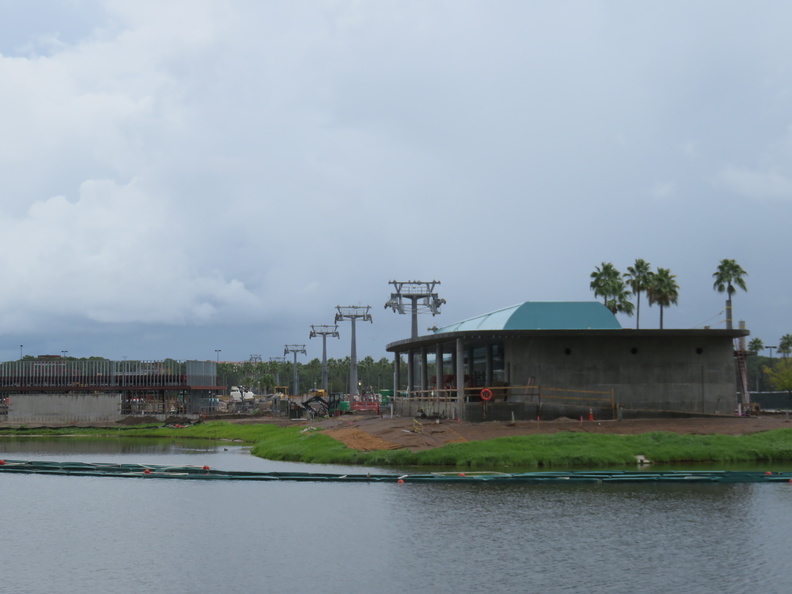 As we took the boat back to Hollywood Studios, the rain started to lighten and by the time we got through security and the ticket gate it had stopped. 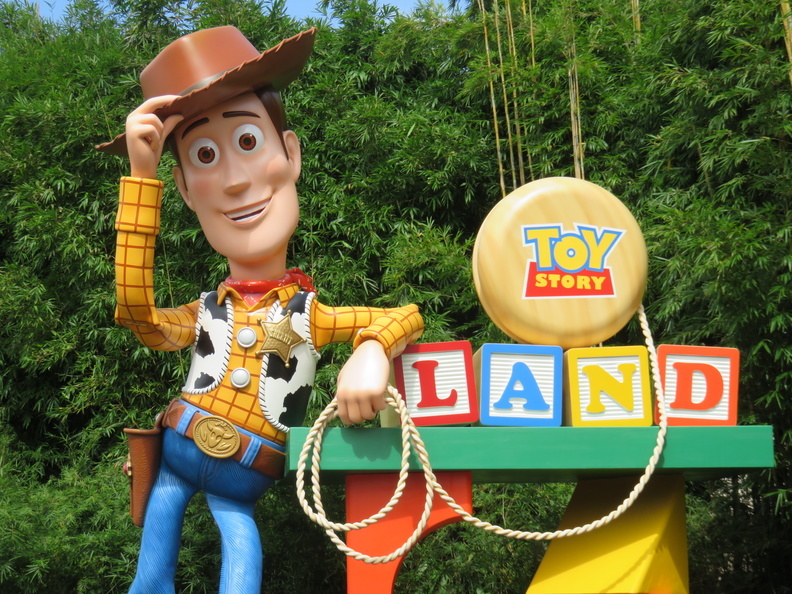 So lucky timing was with us again as it was time to ride the Slinky coaster back in Toy Story Land. It’s a magnetic launch coaster (like Aerosmith or Cheetah Hunt at Busch Gardens, just not as fast) and has two separate launches. 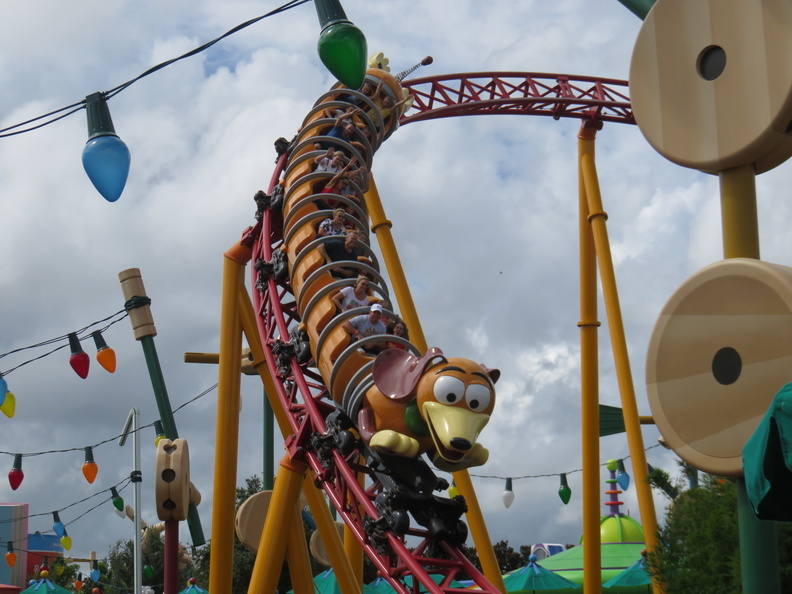 It’s a perfect family coaster and well designed to make you feel like you’re actually riding a dog made out of a Slinky. It was a perfect ride to end our day at the parks.